Jerry Leger’s records stand side by side to John Lennon’s in my living room. It’s only fitting because Lennon’s the first association I got from Coat On The Rack, the opener of the Canadian songwriter’s latest release Nonsense And Heartache. That double LP is a real gem, honestly. It was produced by Cowboy Junkies’ Michael Timmins and features eighteen songs. There are a lot of things that stand out apart from Leger’s voice and vocal delivery, sometimes it’s the melodies or the clever lyrics, other times it’s the overall sound. A special mention should go to the members of Leger’s band The Situation, who are so much more than a backing band. Jerry Leger sounds like an incredible band, rather than a solo artist with some great musicians doing their part. And it really does add an extra special layer to Nonsense And Heartache. 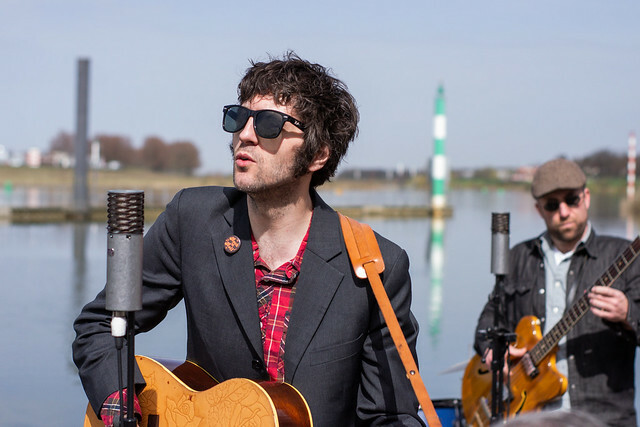 When we recorded this session earlier in 2018 – during the Down By The River festival in Venlo, The Netherlands – Jerry Leger and The Situation were experiencing their first ever European tour. You could feel the excitement, really. ‘Yeah, it was our first trip over! We had an amazing time and the reception was really nice everywhere. It was cool signing older albums that fans would bring to shows. I didn’t expect that. I’m looking forward to coming back and touring Europe on the regular.’ In Baby’s Got A Rare Gun, Leger sings ‘She said, “you better get walking. Come back when you’re fully grown”.’ Well, Jerry Leger is. And so is his band. So you better get yourself to one of their shows this fall. Audio recorded by Matthijs van der Ven & mixed by Martijn Groeneveld.